On Friday, March 23, the European Council of the EU, meeting in its Article 50 configuration—that is, without UK Prime Minister Theresa May—welcomed the agreement of EU and UK negotiators on parts of the legal text of the Withdrawal Agreement and issued guidelines for the negotiation of an overall understanding of the framework for the future relationship between the EU and UK. That understanding will be elaborated in a political declaration that will accompany and be referred to in the Withdrawal Agreement. But the heads of state and government of the EU 27 underscored the challenges that lie ahead. The negotiators must still agree on how the UK will ensure that the border between Ireland and Northern Ireland remains open and they must, of course, also agree on the framework of the future relationship, something about which the EU and UK have very different views. They must reach an agreement on these and all the other still-unresolved issues by autumn at the latest if the UK Parliament, the European Parliament and the EU Council of Ministers are to have sufficient time to consider and formally approve the Withdrawal Agreement by March 29, 2019. By the terms of Article 50 of the Treaty on European Union which governs the withdrawal procedure, the UK will leave the EU on that date, with or without a Withdrawal Agreement. Without one, on that date the UK will go over the cliff-edge in the hardest possible Brexit. Several days before the meeting, the chief negotiators, Michel Barnier for the EU and David Davis, the British Secretary of State for Exiting the EU, presented a color-coded version of the 129-page draft Withdrawal Agreement. Significant portions were shaded in green, indicating text that has been agreed by the negotiators and needs only technical legal revisions in the coming weeks. But there were also significant portions shaded in yellow, indicating that, while the negotiators agree on the policy objective, drafting changes or clarifications are still required. And there were other portions that weren’t color-shaded, indicating text that has been proposed by the EU on which discussions are ongoing. Prominent among the sections shaded in green, indicating agreement by both sides, were the provisions on the transition period the UK requested after its exit from the EU on March 29, 2019. All of the conditions stipulated by the European Council at its December meeting when it agreed in principle to the UK’s request for a transition period have been accepted by the UK. The transition period, during which the UK will remain in the EU’s Single Market and Customs Union, will end on December 31, 2020. During the transition period, all existing EU regulatory, budgetary, supervisory, judiciary and enforcement mechanisms will apply to the UK; it will continue to adhere to the EU’s “four freedoms,” including the free movement of EU citizens into the UK; it will continue to make its full budgetary contribution; it will continue to be subject to the jurisdiction of the Court of Justice of the EU; and it won’t participate in any EU institutions unless invited to do so in specific instances. The agreement on the transition period will no doubt ease the anxieties of the British business community, which fears, as its worst-case scenario, a “hard Brexit” next March. On the other hand, as Barnier and the EU have said on many occasions, “nothing is agreed until everything is agreed.” The transition period will occur only if a Withdrawal Agreement is formally concluded by March 29, 2019. If the differences between the EU and UK on the transition period have been resolved, the same cannot be said about the differences between them in regard to the Irish border. The negotiators have prepared a draft Protocol on Ireland/Northern Ireland the terms of which will be annexed to the Withdrawal Agreement and will apply unless a future agreement between the EU and UK is agreed which addresses the unique circumstances on the island of Ireland, including by avoiding a hard border and protecting the Good Friday or Belfast Agreement of 1998. Some portions of the Protocol are shaded in green, indicating agreement between the negotiators, and other portions are shaded in yellow, indicating that, while the negotiators have agreed on the objective, changes or clarifications are still needed. But some of the most important sections—in particular, chapter 3 on the “common regulatory area”—remain unshaded, indicating that there is, as yet, no agreement on either the objective or the language of the text proposed by the EU. No progress has been made thus far in establishing a “common regulatory area”—defined as an area without internal borders in which the free movement of goods is ensured and North-South cooperation protected—between the EU and the UK with respect to Northern Ireland and in fact Theresa May explicitly rejected the concept of a “common regulatory area” in the House of Commons. In circulating the draft Withdrawal Agreement to the EU 27 member states and the European Parliament last week, the Commission noted that a “legally operative version” of the “backstop” solution for the border must be agreed as part of the text of the agreement and will apply unless and until another solution is found. And it noted that while the negotiators have reached agreement on some elements of the draft Protocol and agree that the full set of issues related to avoiding a hard border must be addressed in any solution, there is as yet no agreement on the right operational approach to the issue. There is, of course, one obvious way to create a “common regulatory area” that would ensure an open border and the free movement of goods between the EU and Northern Ireland while also maintaining the full integration of Northern Ireland in the UK internal market—by the UK remaining in the EU’s Customs Union. But the British government has consistently ruled out that option—most recently, in Theresa May’s recent Mansion House address. Absent membership in the Customs Union, it is not obvious how the UK can ensure that the border between Northern Ireland and the EU remains open. But if it doesn’t ensure an open border in “legally operative” language, there won’t be a Withdrawal Agreement or a transition period. At first glance it would appear that agreeing on the framework of the future relationship will be much less difficult than agreeing on “legally operative” language that will ensure an open border and the free movement of goods between the EU and Northern Ireland. After all, as Michel Barnier demonstrated to the European Council at its December meeting with a PowerPoint slide, the UK’s frequently-reiterated “red lines”—its refusal after the termination of the transition period to make a financial contribution to the EU budget and accept the jurisdiction of the ECJ, the free movement of EU citizens into the UK, and the regulatory authority of the EU in trade policy – exclude every type of possible future relationship— membership in the European Economic Area (the Norway alternative), membership in the European Free Trade Association (the Switzerland alternative), a Deep and Comprehensive Free Trade Agreement (the Ukraine alternative), membership in the Customs Union (the Turkey alternative)—except a Free Trade Agreement such as the EU-Canada Comprehensive Economic and Trade Agreement (CETA). 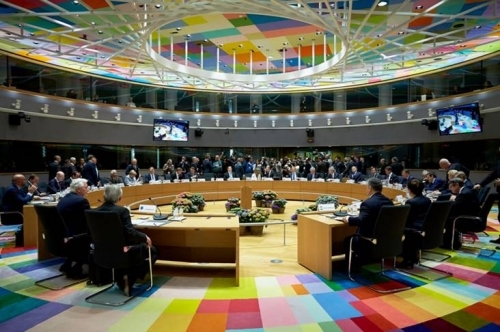 The European Council reiterated that position in the guidelines adopted Friday in regard to the negotiation of an overall understanding of the framework for the future relationship. It confirmed its readiness to initiate work toward a “balanced, ambitious and wide-ranging free trade agreement (FTA)” to be finalized and concluded once the UK is no longer a member state. But it noted that such an agreement cannot offer the same benefits as membership and cannot amount to participation in the Single Market or parts thereof. And it reiterated once again what it has often said—that there can be no “cherry picking” through participation in the Single Market on a sector-by-sector approach, something that would undermine the integrity and proper functioning of the Single Market. According to the guidelines, the free trade agreement will address trade in goods with the aim of covering all sectors and seeking to maintain zero tariffs and no quantitative restrictions with appropriate accompanying rules of origin. There will be appropriate customs cooperation, preserving the regulatory and jurisdictional autonomy of the parties and the integrity of the EU Customs Union. And the FTA will address trade in services with the aim of allowing market access to provide services under host state rules, including in regard to the right of establishment for providers, consistent with the fact that the UK will be a third country and will no longer share a common regulatory, supervisory, enforcement and judiciary framework with the EU. At the risk of oversimplifying, the EU wants a Free Trade Agreement and the UK wants EU lite. But it’s obvious, both from the extraordinary bargaining advantage Article 50 gives the EU vis-à-vis a departing member state and from the results of the negotiation over the past year, that what the UK gets will depend not on what it wants but on what the EU is willing to give it. As long as the UK’s “red lines” remain in effect, that means a free trade agreement. And the UK may not even get that; after all, once the transition period begins on March 30, 2019, it will have only 21 months in which to negotiate the free trade agreement. Most trade specialists think that will not be enough time; it took the EU and Canada more than five years to negotiate their Comprehensive Economic and Trade Agreement (CETA)—an agreement which, although not nearly as complex as the one envisioned in the Mansion House speech, is more than 1600 pages in length. No wonder some are already anticipating that, at some point between March 30, 2019, when the transition period begins, and December 31, 2020, when it ends, the UK will have to request an extension of the transition period—something the EU may not grant—or relinquish its “red lines” and agree to remain in the Single Market and Customs Union. Written by David R. Cameron, a professor of political science and the director of the MacMillan Center’s Program in European Union Studies.